The men’s and women’s track teams continued their success at two meets over the past few weeks. The first meet was hosted by the NESCAC opponent Conn. College. As a team, the Cardinal women placed 11th of 19. However, the most impressive performance of the season came from Sara Pinsonault ’20, who broke the 3000m steeplechase record by over 10 seconds with a blazing 11:19.06. Her record shattered the one set by current Wesleyan graduate student Christina Hebner. Pinsonault went on to discuss her fear of becoming a steeplechase fail video on Youtube, which is every runner’s worst nightmare. 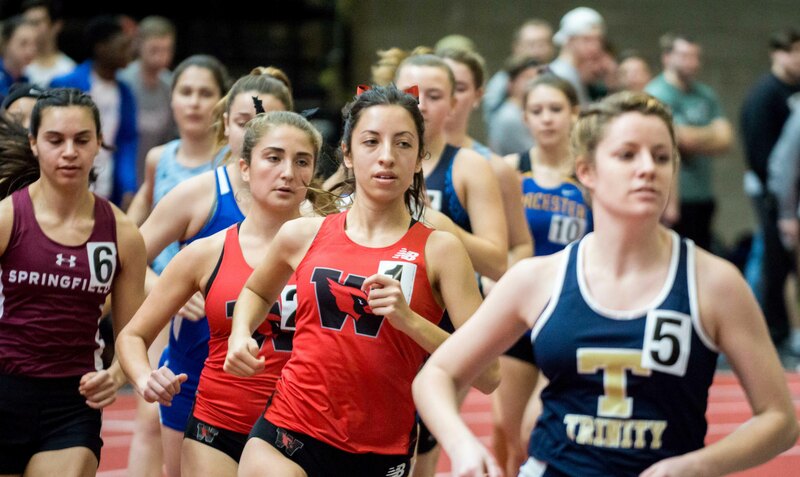 Another impressive performance came in the form of a fourth-place finish by Jenny Aguiar ’19, who broke sixty seconds in the 400m dash with a 59.75. First-year Becky Lopez-Anido added to the Cardinals’ team point tally with a 2:18.11 time, tallying a fifth-place finish. In field events, Tara Peng ’20 and Sydney Forrest ’20 vaulted to 3.10m and 2.90m, earning sixth- and ninth-place finishes, respectively. Alex Dibrindisi ’19 won the Cards two ninth-place finishes in the long jump (4.71m) and the triple jump (10.16m). The women’s team carried its momentum into the Elmer Swanson Invitational, which it hosted last Saturday, April 21. The three-team meet included Salve Regina University and Nichols College. Again, Aguiar stood out, sprinting to two first-place finishes in the 200m (26.71) and the 400m (58.34). Both times were well below NESCAC qualifying standards, and Aguiar is sure to compete among the best at the championships this weekend. Another impressive performance came in the 800m, as Julia Mitchell ’19 ran to a first-place finish in 2:27.11. Going up in distance, Pinsonault continued her impressive form with a sub-five minute time of 4:54.36 seconds in the 1500m, earning first place in the event. In the relays, the women’s 4×400 (Julia Cella ’21, Dibrindisi, Tess Holland ’18 and Katie Maehl ’19) worked their way to a first-place finish with a time of 4:12.96. Peng earned yet another first-place finish in the pole vault (3.10m) and was followed through to fourth place by three of her teammates: Forrest, Colleen O’Neill ’18, and Shannon Sweeney ’21, respectively. In the shot put, Caroline Diemer ’18 threw her way to the top, with another first-place finish for the Cards (10.95m). The men’s team ran at the same meets as the women over the past two weeks. At the Silfen Invitational, the Cardinal men fought to a thirteenth-place finish with 24 team points. The team had excellent finishes by Kevin McMorrow ’20 in the 3000m steeplechase (9:40.52), Kevin DeLoughry ’21 in the 400m hurdles (56.04), and Andrew McCracken ’19 (4.55m) in the pole vault. The latter two earned six points each with their strong third-place finishes. Also in the pole vault, Jessy Carrasco ’18 cleared 4.10m for an eighth-place finish while teammates Grant van Inwegen ’20 and Connor Sexton ’20 battled to twelfth (4:02.27) and fourteenth (4:02.94) overall in the 1500m run. At the Elmer Swanson Invitational, the men’s team hosted Salve Regina University, Nichols College, and Norwich University, claiming nine event victories. Drew Trotman ’18 sprinted to wins in the 100m (11.81) and the 200m (23.63). The 400m sprint saw Kyron Roberts ’21 cross the line for first (50.40), followed closely by teammate Jay Carter ’21 in third (53.36). In the 800m, an entertaining duel between van Inwegen and Sexton finished with the former edging the latter with a 1:57.38 time. At the pole vault, McCracken took first with a leap of 4.57m. The next time to see the Cardinals compete will be at the NESCAC Championships this Saturday, April 28. Fortunately for Wes track enthusiasts, the meet is just a short drive away at nearby Trinity College.